I bet we´ll be making Gazpacho and ice cream in February too if the craving strikes! That looks so good! I’m not sure what I’ll be cooking this week, or not cooking. The high was around 45 Celsius today. 114 F! Maybe just ice for us! Oh lord…that IS hot! Maybe ice with an extra side order of ice, whilst sat in an ice bath would be best?! Looks great. It’s so hot. Blah. I ordered pizza for dinner. I’ll take fall off the bone good over artistic any day. It sounds delicious and isn’t it nice to have seconds in the freezer. I say, when you have a craving do it and forget the weather. You´re right, not all dishes can be stars of the screen! And yes, it´s good to know I have a delicious meal tucked away for when the thermometer drops. I can certainly identify with giving in to a craving, regardless of the temperature outdoors. Besides, what’s a little discomfort when the result is a fantastic dinner like the one pictured? I have to try this one. I guess we all have these moments of madness, but it was most definitely worth it! And now I´ve got another pot all tucked away for a rainy (!) day…. It looks delicious and sounds like something you can just leave to cook and then eat in the cool of the evening – no standing over a hot cooker! It would be good in winter too, so I think I’ll stay with more summery food for the moment. I confess, I put the oven on then escaped to the patio while it was cooking! Friends are amazed when I tell them that, particularly during the day, it´s cooler to eat in the house (except when the oven is on of course). I think you mentioned something similar in one of your posts. What a fabulous comfort meal and is perfect for the cold weather we are having. Yummo. Puchero? I just moved to Granada after living in a small town in Córdoba for three years, so I’m still getting used to some of the new vocabulary (and new provincial foods)! Is puchero a stew as well? – (And I added three little cayenne peppers to give it the slightest bit of spice! Make sure to take them out before serving though. Unless you’re feeling vengeful the day you cook it, heheheh). 1. En la olla a presión se pone aceite y freimos los garrones hasta dorarlos. 2. Añadir cebolla picada, sofreir, y añadir alcachofas cortadas por la mitad, los guisantes y las zanahorias. 3. Poner sal y echar agua (in my case, yummy wine! ), se tapa la olla, dejando cocer 15 minutos. 4. Despues de los 15 minutos, se abre la olla y se echan las patatas cortadas. 5. Se deja terminar la cocción hasta que las patatas estén hechas. I would definitely recommend you invest in an olla a presión! I started learning how to cook last Fall, and it has truly been a lifesaver! My mother-in-law gave me her mother’s olla, so it’s over 60 years old, but sturdy and good-as-new. It could be that the newer ones they sell now might be made from a less sturdy material (like the aluminum “cafeteras” – yuck! ), but if you ask around your pueblo, I’m sure someone will know of someone or somewhere that continues to make them in their original fashion. Wow – thank you SO much! Will definitely give this a go as we both love platos de cuchara. 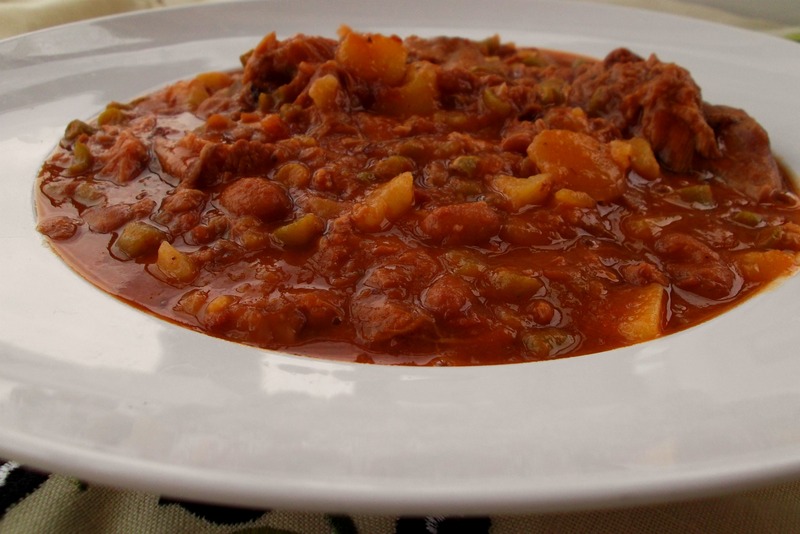 Puchero, or olla is similar – chick peas stewed with chicken joints, the salted pork bones (huesos añejos), tocino (fresco or salado), pork if you want it heavier (!) and then some people add carrots, potato in winter. It´s very filling and you get a lovely stock and creamy chick peas. You also put in a few of the little guindillas, bay leaves and a few cloves…soak the chick peas overnight, then put everything into the pot, bring to a rapid boil for about 5 minutes, skim then simmer very slowly for 2-3 hours (I do it in my oven very low but you could use your olla!). I usually only put chicken in and make sure I put lots of water so I have plenty of stock for another day! Aren´t we lucky to be learning from “proper” Spaniards – most of the recipes I have been taught don´t bear that much resemblance to those in cookery books, they´re usualy much simpler but oh so tasty! PS. My Big Man is a Granadino – provincia rather than ciudad. Yumm… I also heated up the kitchen the other day making a slow cook pork rib sauce. It hardly compares to this though, love the addition of beans and smoked bacon. Feels like great comfort food and regardless of the weather, sometimes that just feels so right. I love pork shanks and borlotti beans! It is a very hearty dish!! I would say that this is soooo comfort food!! And who cares it it’s 32°C outside if it is delicious! I only discovered them here in Spain – have never seen them in the UK, but they are delicious! Reply: And mine is a Cordobés – provinicia rather than ciudad as well! 🙂 But my, how some of the words (even just for food) change! Ask your Big Man what “picadillo” is. D-Man made it the other day (it is basically just finely chopped onion, green bell pepper, and tomato with a dash of salt and vinegar – a salad) and later I found out through a student that “picadillo” in Granada is something completely different! (But can’t remember what). Yes, I’m so grateful that I’ve been learning how to cook here. I LOVE that the dishes are simple, rich in veggies, and that they really just seem to hit the spot. I don’t think I’ve ever loved food so much. Madness eh…but when the craving strikes!